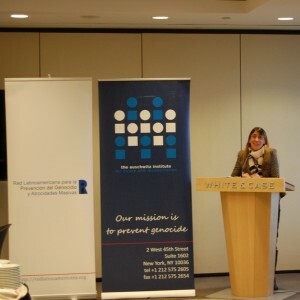 On the evening of March 8, 2016, the Auschwitz Institute for Peace and Reconciliation (AIPR) held a launch event for the 2015 Annual Report of the Technical Secretariat of the Latin American Network (available in both English and Spanish) at the offices of White&Case LLP in New York City. 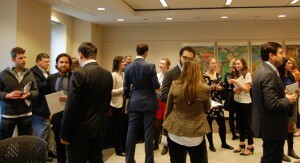 The launch was attended by representatives from many participating countries of the Latin American Network, including Argentina, Brazil, Chile, Colombia, Costa Rica, Ecuador, Mexico, Peru, the Dominican Republic, and Uruguay. Members of civil society and the international community were also present, with representatives from the Permanent Missions of Belgium and Germany alongside those from the Global Centre for the Responsibility to Protect, the International Coalition for the Responsibility to Protect, the Vance Center for International Justice, and the Historical Memory Project in attendance. 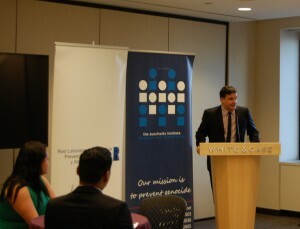 The launch event featured a number of speakers, highlighting the collaborative nature of the efforts made by the supporters, partners, and Technical Secretariat of the Latin American Network. 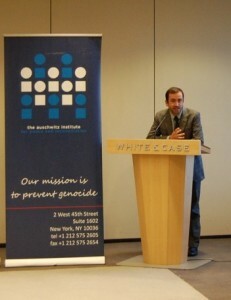 Speaking first was Dr. Tibi Galis, Executive Director of the Auschwitz Institute for Peace and Reconciliation (AIPR). Dr. Galis welcomed the audience and gave a brief introduction to the nature and work of the Latin American Network, including the efforts of its partners and participating member countries. 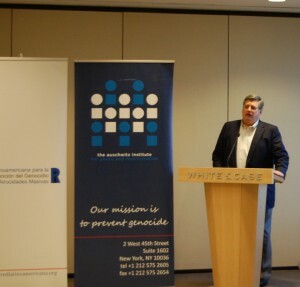 Following Dr. Galis’ remarks, Mr. Owen Pell, Partner at White&Case, took to the podium to discuss the ways in which the Latin American Network is “laying a path on the road to developing the Rule of Law around principles of genocide prevention.” Mr. Pell sees the Network responding to the challenge of moving relevant international norms down to the state level in two primary ways: First, the Latin American Network is carrying out activities on a consistent basis. This serves to normalize the acceptance of these norms on a broad social level, so that they become “second nature”. Second, the Network is demonstrating that this type of work is possible, repeatable, and can be enacted at scale. Thus, he explained, the Latin American Network is making historic strides towards reinforcing the Rule of Law in regards to genocide and mass atrocity prevention in Latin America. AIPR’s Latin American Programs Coordinator, Ms. Stephanie Alvarez, spoke next. 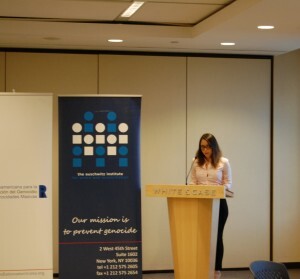 Ms. Alvarez introduced the structure, objectives, history, and operation of the Latin American Network for Genocide and Mass Atrocity Prevention. Created in 2012, the Latin American Network is a collaborative effort made by Latin American states that aims to build the regional and national foundations necessary for the prevention of genocide and mass atrocities. Composed of 18 participating member countries, the Network also aims to empower Latin American states to become leaders in prevention on the international scene, added Ms. Alvarez. Ms. Alvarez was followed by her colleague, Ms. Eugenia Carbone, the Director of AIPR’s Latin America Program, which serves as the Technical Secretariat of the Latin American Network. Ms. Carbone delved into a more comprehensive explanation of the programs and activities undertaken by both the Latin American Network and the Technical Secretariat during the year 2015. Ms. Carbone explained that 2015 was not only a highly productive year, but also a time for the consolidation of the Network by its members. This was provided for with the adoption of the Declaration of the Latin American Network for Genocide and Mass Atrocity Prevention, a significant advance that took place during the IV Focal Points Meeting on May 29, 2015 in Santiago, Chile. This will continue through into 2016, as the Latin American Network is set to complete the third of three cycles of the Raphael Lemkin Seminar for Genocide Prevention for the Latin American Network, as was initially agreed upon by the member states of the Network. Already now at the age of 4, the Latin American Network is showing its potential as a regional tool to support the mainstreaming of atrocity prevention in national agendas. This experience continues to resonate in other continents and at the global level. But this remarkable progress constitutes as much an opportunity as it is a responsibility. Ms. Carrie DuLaney, Program Officer at the Stanley Foundation, concluded the evening’s remarks. Ms. DuLaney reflected on the Stanley Foundation’s early and consistent support for the Latin American Network, as evidenced by its role in co-organizing the first Focal Points meeting in Argentina and its involvement in each subsequent meeting. 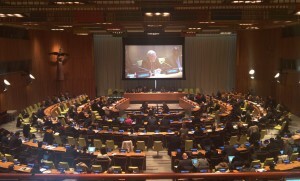 She also touched upon several new advances made by the Network, which she described as a “vibrant and effective platform for prevention,” explaining that the acceptance of the Declaration of the Latin America Network represents a “significant milestone” which works to reaffirm the Network’s importance in contemporary prevention efforts. These efforts, mentioned by several of the aforementioned speakers and represented in full by the Annual Report, have not gone without notice by the international community. During a recent United Nations General Assembly panel discussion, entitled “from commitment to implementation: ten years of the responsibility to protect,” UN Deputy Secretary-General, Jan Eliasson, highlighted the efforts of the Latin American Network and other regional and international bodies of cooperation, explaining that these collaborative entities enhance the ability of states to react in a timely manner to “prevent a downward spiral towards systematic violence. They help identify ways to assist States to better protect their populations.” A video recording of the Deputy Secretary-General’s remarks is available here. The 2015 Annual Report of the Technical Secretariat of the Latin American Network for Genocide and Mass Atrocity Prevention (http://www.redlatinoamericana.org) is available in English and in Spanish. For more information about the Latin American Network and/or AIPR’s programming in Latin America, please contact Stephanie Alvarez at stephanie.alvarez@auschwitzinstitute.org.